Kicking off a busy day in the SSD industry, today we're looking at the launch of Samsung's new 860 PRO SSD. 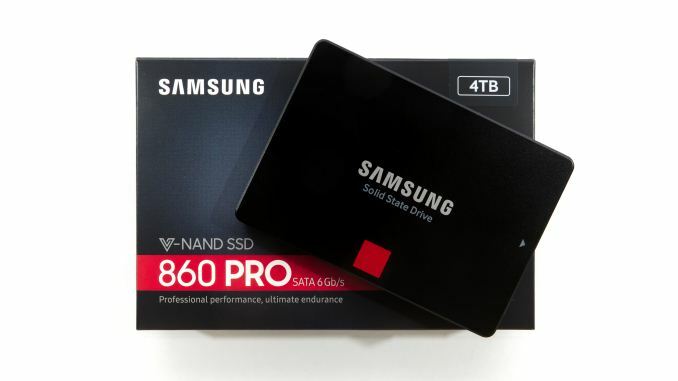 The Samsung 860 PRO is an update to the venerable 850 PRO SATA SSD, and comes at a time where Samsung faces more serious competition than they have in several years, but also when the market has almost entirely moved on from premium SATA SSDs. The 860 PRO uses the latest 64L 3D MLC NAND and LPDDR4 DRAM from Samsung plus a new revision to their highly successful SATA SSD controller series. Accordingly, the latest PRO SSD from Samsung isn't meant to be a game-changer like its predecessor, but rather is a natural evolution of Samsung's SATA SSDs – at least as much as SATA SSDs can evolve. For the SATA SSD market then, the 860 PRO stands to be the latest, greatest, fastest, and possibly last(est) high-end desktop MLC SATA SSD that we'll ever see. The Samsung SSD 850 PRO introduced 3D NAND flash memory to the consumer SSD market over three years ago. Since then, it has reigned as the top SATA SSD. The combination of Samsung's MLC 3D NAND and their top-notch SSD controller gave the 850 PRO performance and write endurance that were nearly unbeatable. The SSD market now is very different from when the 850 PRO launched in mid-2014. All the attention for premium SSDs is now focused on the NVMe market where significant performance differentiation is possible. The mainstream SSD market has shifted to using TLC NAND instead of MLC NAND, first in the SATA segment and now even most NVMe SSDs are adopting TLC. At first, the switch to TLC was a race to the bottom that left the 850 PRO almost completely unchallenged. In 2016, Intel and Micron brought the second 3D NAND implementation to market, but their 32-layer 3D floating gate NAND flash proved to be slower (though cheaper) than Samsung's. In 2017, Toshiba and Western Digital/SanDisk finally produced 3D NAND suitable for the mass market, and the second-generation 3D NAND from Intel/Micron debuted. With 64-layer 3D NAND and more mature SSD controllers, these competitors have finally started to challenge the performance of the Samsung 850 PRO—usually while beating it on price. Samsung hasn't been standing still. In addition to extending their dominance into the NVMe SSD market, Samsung has quietly updated the 850 PRO and 850 EVO without introducing new naming. 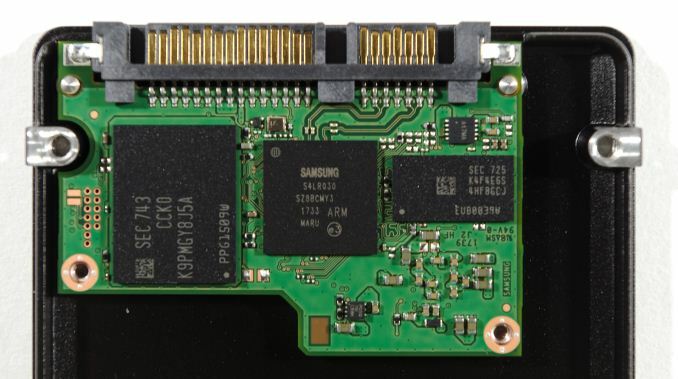 In mid 2015, Samsung introduced 2TB models to both SATA families, and updated the controllers to support LPDDR3 DRAM instead of the LPDDR2 initially used by the 850s. Over the course of 2016, Samsung moved the 850s from their second-generation 32-layer 3D NAND to their third generation 48L 3D NAND. This brought a doubling of the capacity of each NAND die, and allowed Samsung to produce 4TB versions of the 850 PRO and EVO, though only the 4TB EVO actually made it to market. The changes the 860 PRO brings over the 850 PRO are pretty mundane. The controller has been updated again to support new memory: now codenamed MJX, it uses LPDDR4 DRAM. Samsung hasn't shared whether it deviates from their pattern of two or three ARM Cortex-R cores, nor what the clock speeds or fabrication process node are. The flash memory has been updated to Samsung's 64L 3D MLC, their fourth generation of 3D NAND. The Samsung 860 PRO is our first look at Samsung's 64-layer MLC V-NAND, after several encounters with the 64L TLC last year. Both 860 PRO models we have tested use 256Gb dies that are substantially larger than the 256Gb 64L TLC dies we have used previously. The most visible change is that Samsung is finally launching the 4TB capacity in the PRO line. The 4TB model may turn heads, but it should not be mistaken for a mainstream product. It is a product born from the same mindset that leads to the GeForce Titan GPUs, Extreme Edition or Threadripper CPUs, and 1.5kW power supplies. The total available market for such products is tiny and often insufficient to justify creating the product. Instead, these parts are valuable for their "halo effect": Samsung's ability to offer a 4TB SSD helps their brand image even among consumers who cannot afford to spend anywhere near this much on their SSD. Aside from the inclusion of the 4TB model, there is little to make the 860 PRO appear superior to the 850 PRO. Power consumption ratings have decreased slightly, but the limits of the SATA connection mean there is little room for performance improvement. The warranty period has dropped from the outstanding 10 years to a more typical 5 years. On the other hand, Samsung has stopped severely lowballing the write endurance rating. At every capacity, the 860 PRO's total write endurance rating is at least doubled, and given the shorter warranty period this yields a drive writes per day rating of 0.64, compared to a maximum of 0.16 DWPD over 10 years for the 850 PRO. The write endurance ratings are still lower than the enterprise PM863a to say nothing of the SM863a's 5.5 DWPD, but among consumer drives the 860 PRO's specified endurance no longer looks like a joke. The other noteworthy recent MLC SATA drive is the Crucial BX300. This drive conveniently solved several problems for Micron. Since their 32L 3D NAND dies can be treated either as 384Gb TLC or 256Gb MLC, the BX300 gives Micron an outlet to sell dies that cannot meet the endurance requirements for use as TLC. At the same time, the smaller usable capacity of their MLC parts makes them more suitable for use in low-capacity SSDs. The Samsung 860 PRO isn't as convenient for Samsung to produce—they have little use for the 64L 256Gb MLC parts elsewhere in their product line so far, nor for a 384Gb TLC part. The Samsung 850 PRO 512GB: Our sample is one of the original generation using 32L 3D NAND and LPDDR2 DRAM, rather than the updated model with 48L 3D NAND and LPDDR3. The Samsung PM981 512GB, a M.2 NVMe SSD for the OEM market, using 64L 3D TLC. A retail version of this is likely to be the successor to the Samsung 960 EVO, and the pricing will probably be on par with the 512GB 860 PRO. Thus, the PM981 illustrates the tradeoffs of sticking with the SATA interface and insisting on MLC NAND when cheaper TLC is good enough for almost all users. The 860 PRO is going to be the most expensive SATA drive in this bunch, and even the one NVMe drive is probably not going to be much more expensive per gigabyte than the 860 PRO when its retail version arrives. Even without the legacy of the 850 PRO, the expectation would be for the 860 PRO to demonstrate clear superiority. Definitely, for client loads you're not going to hit that write endurance before the drive dies from something else. MX500 is cheaper, performs almost the same. And they actually provide warranty service in Canada properly, unlike Samsung.